Tours by appointment. The museum will be open Saturdays (10 to 4) and Wednesdays (from 5 to 7 p.m.) through December. Admission is free. We will continue to keep you up to date on what's happening here and on our Facebook sites. Also you can reach us by email at sayrehistorical@yahoo.com or on our museum phone at 570.882.8221 and leave a message. Valley artist M. Louis Gore is the subject of a feature story in the Sayre Historical Society's latest Quarterly history magazine. The story focuses on Gore's "lost mural" at the Wilbur Hotel in Sayre. SAYRE – The Sayre Historical Society is opening Saturday with a new exhibit “Working on the Railroad” featuring more than 25 unique images of railroad employees working in Sayre. 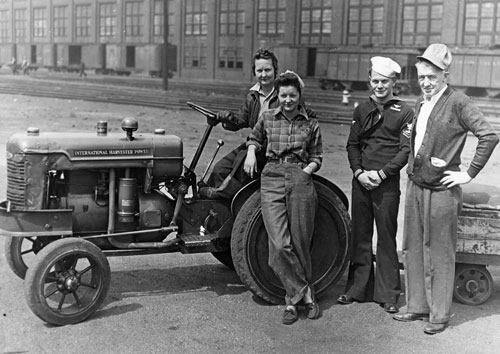 CAPTION: In a June 3, 1944 photograph, Mrs. Clyde Carrington, left, drives a tractor while her daughter, Mrs. Myrtle Pruyne, works in a labor gang. (Her husband was in the U.S. Army). Robert Carrington, second from right, had just returned from the South Pacific when this photograph was taken while Clyde Carrington, at right, was a machinist in the locomotive shop at Sayre. The photograph is one of several featured in a new exhibit at the Sayre Historical Society opening Saturday. The exhibit will be featured in the museum’s Rotating Exhibit Room starting Saturday and running until September 6. A history of the railroad in Sayre from the earliest days is also featured as part of the exhibit. Admission is free. The museum, located in the historic Lehigh Valley Railroad Station in downtown Sayre, features two floors of history including two HO-scale model train layouts, local history displays, military uniforms and a gift shop. The historical society also maintains a Sayre-built Lehigh Valley Railroad caboose (#95011) that is open for tours. A series of ten murals has been added to the Lehigh Avenue wall of the former Newberry building now housing the Desmond Street Guthrie facility. The murals are viewable from the museum grounds. In addition, eight new kiosks outlining the history of Sayre have been added to the area surrounding the museum. The history of the railroad in Sayre starts back in the days of the Pennsylvania & New York Canal and Railroad Company. The earliest mention of a railroad in the Penn-York Valley dates to the proposed Tioga Point Railroad in 1841 that was never built. The exhibit features historical dates compiled by late railroad historian Hart Seeley and author Richard Palmer. In 1849, the New York & Erie Railroad was completed between Owego and Elmira. It wasn’t until 1856 that the Junction Canal opened from Athens to Elmira covering a distance of 18 miles. In 1865, the Pennsylvania & New York Canal and Railroad Company was incorporated taking over the North Branch Canal. The P & NY joined the Southern Central Railroad and the Ithaca & Towanda Railroad at a point between Waverly and Athens that was called Southern Central Junction and later Sayre. Railroad shops were built at Waverly Junction in the 1870’s followed by new shops built in Sayre in 1880. According to the May 16, 1902 Sayre Evening News, new shops were proposed for Sayre that would be able to repair “heaviest class of motive power.” Those shops, often referred to the “System Shops,” were completed in 1904 and the locomotive repair building was called by some accounts the largest railroad shop under one roof in the world. The railroad also offered an apprentice program for young employees starting in about 1909 implemented by F.N. Hibbits, who was superintendent of motive power for the Lehigh Valley and called the “father” of the apprentice system. “The proof of the success of the system is the fact that almost all our boys fulfill their apprenticeships and remain with the company,” said Mr. Hibbits, according to the January 30, 1914 Waverly Free Press. The railroad was a mainstay of the local economy for many years providing employment for thousands of people in Sayre, Athens, Waverly and surrounding areas. Dieselization of the railroad began in 1945 as the Lehigh purchased freight engines from General Motors. Complete dieselization was completed in 1951. In 1962, the Pennsylvania Railroad took total control of the Lehigh Valley Railroad. The move toward highway trucking and other factors spelled defeat for many eastern anthracite railroads including the Lehigh Valley which declared bankruptcy on July 24, 1970. By February 16, 1974, the Lehigh Valley had 599 employees in the Sayre area and on November 20, 1975, it was announced that the Lehigh Valley Railroad and Sayre Shops would not be part of the Consolidated Rail plan. At the time the shops had 275 employees. On March 30, 1976, the era of the Lehigh Valley Railroad came to an end. The Sayre Historical Society is a member-supported organization staffed by volunteers and funded in part by the Bradford County United Way and the Bradford County Tourism Promotion Agency. Starting Saturday, the museum will be open Saturdays from 10 to 4 and Wednesdays from 5 to 7 p.m.
SAYRE – The Spring issue of the Sayre Historical Society Quarterly highlights the life of Asa Packer, father of Robert Packer, whose industrial empire had a direct and long-lasting impact on the history of Sayre. Other stories in the latest issue of the local history magazine are the sale of Oak Grove Park in 1944, the obituary of former postmaster George M. Lull in 1901 and the railroad photographs of the late James F. Ward. 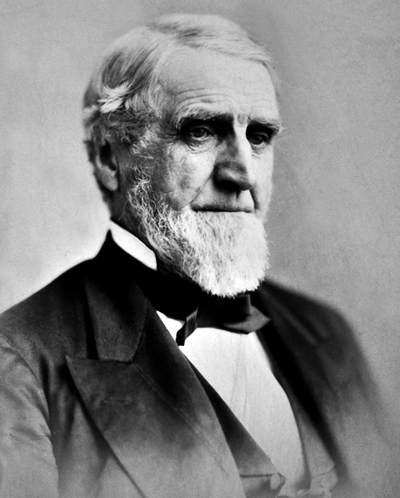 Asa Packer was born in Mystic, Connecticut on December 29, 1805 and used his “receptive mind and habits of thought and observation” to amass one of the country’s great fortunes. But the man who founded the Lehigh Valley Railroad and funded the famous Lehigh University had a humble start when he left his boyhood home and traveled west. 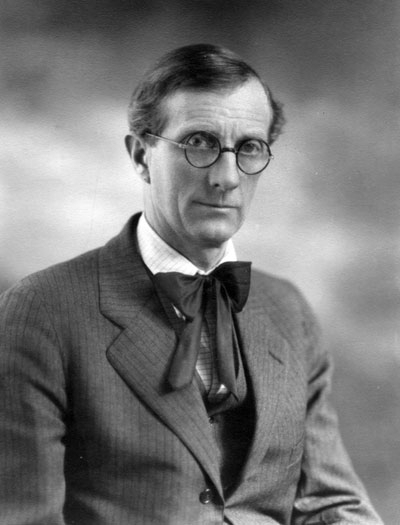 “He packed all his worldly possessions, consisting of a few simple articles of clothing, shouldered his humble pack, and set out afoot to make his way in a great world which was altogether unknown to him,” said Hopkin Thomas, who chronicled Packer’s life for the on-line Hopkin Thomas Project. Packer learned the carpenter’s trade and eventually secured work with the newly-opened Lehigh Canal. “He drove in a primitive sled to Mauch Chunk, made a satisfactory engagement, and then returned home to close up his affairs in time for the opening of navigation. In the spring, he set out to engage in his new undertaking, walking to Tunkhannock, on the Susquehanna River, where he boarded a raft which took him to Berwick, whence he walked to Mauch Chunk,” according to the Thomas account in the Quarterly. Through his connections to the Lehigh Canal and the burgeoning coal trade, Packer became acquainted with Commodore Stockton who helped Packer develop the Lehigh Valley Railroad, according to the July 21, 1869 Tunkhannock Democrat. In his later years, Packer started Lehigh University in South Bethlehem by donating land and money in 1865 and making additional donations ten years later. Packer also served as an associate judge, was an elected member of the U.S. Congress and was even nominated during the National Democratic Convention for president and later governor. His local legacy includes his son Robert, whose home became Robert Packer Hospital, largely though the donation of the vacant home by Robert’s sister, Mary, in 1885. Through the generosity of Mary Packer, the Church of the Redeemer and the former Coleman Memorial Parish House were built. Asa Packer died at the age of 74 on May 7, 1879. One of the Lehigh’s fast passenger trains carried the name of its founder and operated between the cities of Easton, Bethlehem, Allentown and Mauch Chunk. Another story in the Quarterly recalls Oak Grove Park, a short-lived park located on S. Keystone Avenue. An October 19, 1944 article by George R. Loop recounts the site which operated from about 1906 to 1909. The popular recreation spot was located in the 300 block of South Keystone Avenue across from Chemung Street behind the current Family Dollar Store. Loop describes the somewhat unusual location of Oak Grove Park in his article. The article includes a rare photographic view of what is believed to be the entrance to the park from a postcard dated 1907. A story on the late James Ward also includes photographs donated to the Valley Railroad Museum in 1994 and recently printed for the new exhibit at the Sayre Historical Society. Ward worked as a senior electrician for the railroad and later was employed as a test lab technician for IBM for many years. He was born on October 19, 1918, the son of James Lawrence Ward and Anna L. Hughes. He was a 1936 graduate of Sayre High School, a member of the Epiphany Church and enjoyed amateur radio, electronics, photography, fishing and watching baseball games, according to his obituary. He married the former Marilyn Jayne Vaughn in 1945. A double page view of the former Robert Packer Hospital and a four-page section on the R. & E. Pattern & Foundry Corp. in Sayre is also included in the issue. A 1959 photograph shows John Polinski playing accordion as part of a Sayre Recreation Talent Show. Polinski was also a member of a musical group called the Hi-Lo’s, formerly known as the Eight-Teens. The photograph was donated to the historical society by Sandra Paluzzi. The Sayre Historical Society is a member-supported, non-profit organization and a recipient of funding from the United Way and the Bradford County Tourism Promotion Agency. SAYRE – A collection of artifacts from the history of Scouting in Sayre will be featured at the annual dinner of the Sayre Historical Society on Tuesday, March 12 at Sayre High School. The dinner will include a program by Sayre historian James Nobles on “Remembering Our Past.” The deadline for reservations is March 1 and the cost is $20. Reservations for the dinner/program can be made by calling Mary Sargent at (570) 888-6081 or Tom Collins at (570) 888-6821. The dinner is open to the public. 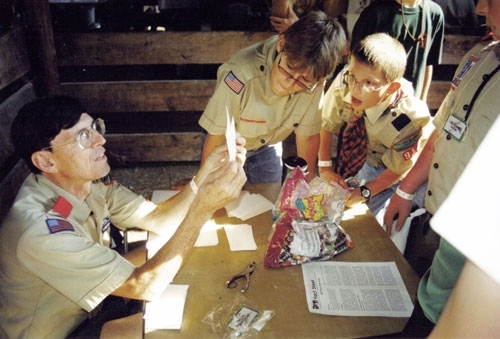 CAPTION: Sayre Troop 17 Scoutmaster Cliff Cyr (left) assists a group of scouts at an event held in 2007 at the Troy Fairgrounds. A display of scouting memorabilia has been added to the Sayre Historical Society’s Annual Dinner being held March 12 at the Sayre High School. The Scouting display is being organized for a new exhibit opening on September 7 at the Sayre museum. The exhibit will cover both Boy Scouts and Girl Scouts in Sayre and will run until December 22. Among the various items that will be on display are uniforms from the past, camping gear, banners and photographs. More information and artifacts are being sought for the exhibit. Contact the Sayre Historical Society at 570-882-8221 to loan items for the display. One of the highlights of Scouting in Sayre occurred on a cold December day in 1947 when 16-year-old Boy Scout Sidney Daniels jumped into Packer Pond and saved the life of a young man who fell through the ice while ice skating. The December 19, 1947 Sayre Evening Times stated that Daniels heard the call of the boy who had fallen into the pond in water that came over his head. Daniels, the article said, found a long pole and rushed to assist the boy. The boy however, was unable to grab the pole so Daniels dropped into the water and loosened the boy’s skates which had become tangled in weeds. The boy was able to make his way to the nearby shore, the article said. According to a news account in the July 30, 1948 Sayre Evening Times, Daniels was honored with the Boy Scouts of America Gold Medal for Life Award for his life-saving measures. The medal is the highest honor possible in Scouting and is awarded to only a handful of scouts each year. The award presentation was made in Howard Elmer Park during one of the weekly band concerts by the Lehigh Valley Railroad Shop Band. The award was made by L.E. DeLaney, chairman of the General Sullivan Council Court of Honor Committee to Daniels and his mother, Mrs. Paul Davidson, according to the article. Troop 7 Scoutmaster Leon Shershen was also in attendance. Historical accounts state the first troop of Boy Scouts in Sayre was organized in 1911 with nine boys which soon grew to over 65 in one year. The annual dinner, prepared by the Nutrition Group at Sayre, will feature chicken breasts in herbed sauce, meatballs marinara, pasta alfredo, tossed salad, seasoned green beans, dinner rolls, fruit crisp with ice cream and brownie sundaes. Doors open at 5:30 with dinner served at 6. The Sayre Historical Society Museum will reopen for the 2019 season on Saturday, April 6 with a new exhibit “Working on the Railroad: Sayre and the Lehigh Valley Railroad” centering on the development of the railroad industry in Sayre from the late 1860’s to the present time. Numerous rare images of local railroad employees at the Sayre Shops will be included in the exhibit. The Sayre Historical Society is a non-profit historic preservation organization staffed by volunteers and located in the Lehigh Valley Railroad Passenger Station. The member-supported group receives funds from the Bradford County United Way and the Bradford County Tourism Promotion Agency. Reservations for the dinner/program can be made by calling Mary Sargent at (570) 888-6081 or Tom Collins at (570) 888-6821. The dinner is open to the public. The deadline for reservations is March 1. The cost is $20. The dinner will be prepared by the Nutrition Group at Sayre Area High School. The menu will feature chicken breasts in herbed sauce, meatballs marinara, pasta alfredo, tossed salad, seasoned green beans, dinner rolls, fruit crisp with ice cream and brownie sundaes. Doors open at 5:30 with dinner served at 6. The program will follow dinner. The program on “Remembering Our Past” will be presented by the founder of the Sayre Historical Society who was a former history teacher and the first president of the non-profit organization when it was formed in 1989. “Sayre experienced the same significant events over the past century as those which dominated the nation as a whole,” said Nobles. The presentation, which will follow the annual dinner, will highlight those national events by telling the story from the local point of view. 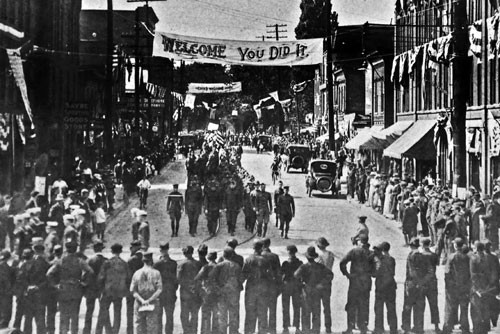 “The program will begin with the dedication of the Doughboy Monument in Howard Elmer Park and the celebratory parade in downtown Sayre honoring the returning veterans from World War I,” he said. The Sayre Historical Society is a non-profit historic preservation organization staffed by volunteers and located in the Lehigh Valley Railroad Passenger Station. The member-supported group receives funds from the Bradford County United Way and the Bradford County Tourism Promotion Agency. Visit www.sayrehistoricalsociety.org or Facebook for more information. SAYRE – The Winter Quarterly from the Sayre Historical Society features an account of the Sayre Bottling Works which was a successful beverage company until Prohibition in 1920. The illustrated booklet also has a story on former Sayre resident Peter Cacchione, who was elected a New York City Councilmen in the years following the Great Depression as well as a story on the 1916 wedding of Dr. Donald Guthrie to Emily Baker in New York City. A special feature of the Quarterly is a letter from the late President George W. Bush on the occasion of Sayre’s Centennial in 1991. 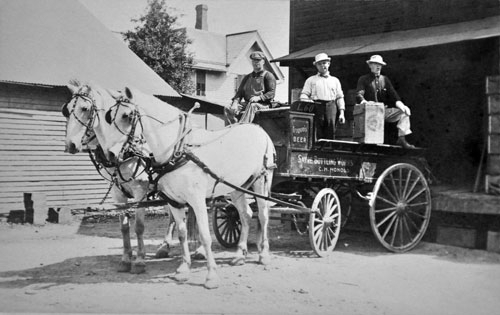 CAPTION: A horse-drawn delivery wagon from the Sayre Bottling Works from about 1916, pictured above, is the cover photograph of the Winter issue of the Sayre Historical Society’s Quarterly history magazine, now available. The Quarterly is a benefit to members of the Sayre Historical Society and is delivered by mail to members four times per year. Individual copies are available from the Sayre Historical Society and Carl’s News Stand in Sayre. The Sayre Bottling Works was located at 117 N. Lehigh Avenue (near the location of the late Mac Davenport’s Garage) in the years before Prohibition. The cover photograph shows the name “C.H. Honold” on the side of the wagon which is drawn by two white horses. Honold was born in Westfield, Pa. and worked for a time as a boiler inspector for a tannery in Powell, Pa. and later worked for Swift & Co. of Elmira. He passed away in 1949. Honold was preceded as owner by Charles C. Wolfe who learned the trade of boilermaker and was employed as a boiler inspector in the roundhouse for the Lehigh Valley Railroad for 12 years. He passed away in 1909. Wolfe was preceded at the Sayre Bottling Works by Eugene (Jud) Connelly who owned the popular Springs Corner Hotel and sponsored a well-known baseball team for many years. Connelly was involved in a tragic accident when the car he was driving was struck at a railroad crossing near Odessa, NY in 1913. Connelly was killed along with his daughters, Phoebe, age 22 and Carolyn, age 19. His wife was severely injured in the mishap. A photograph of the Springs Corner Hotel is included in the article as well as an advertisement for the Sayre Bottling Works. Pete Cacchione was the subject of a book written in 1976 highlighting the rise of the former Sayre man and World War I veteran who became New York City’s first councilman elected as a Communist during the years following the Great Depression. Gerson said Cacchione, whose sister was the well-known Molly Cacchione and whose parents operated a bakery on Sayre’s East Side for many years, was “mourned by hundreds of thousands” when he passed away in 1947. A photograph of the Wilbur Hook & Ladder Co. Band of Sayre is featured in the booklet centerfold section. The photograph was donated by Patricia Bostwick Eddy of Farmington, NY. The Winter Quarterly also includes an advertisement from the Sayre Theater from 1940 featuring Laurence Olivier and Joan Fontaine in the movie Rebecca as well as movies featuring George Raft, Edward G. Robinson and Shirley Temple. The program was donated by Ted Pinkard of Sayre. The Sayre Historical Society is a member-supported historic preservation organization staffed by volunteers. It is funded in part by the Bradford County United Way and the Bradford County Tourism Promotion Agency. Visit www.sayrehistoricalsociety.org or Facebook for additional information. 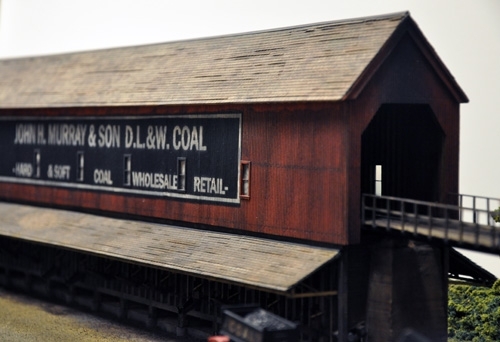 SAYRE – Model Train Day will feature a unique model of the historic coal trestle of John H. Murray & Son painstakingly created in HO-scale by Rick Thorne of Athens. The annual event will be held on Saturday, November 24 at the Sayre Historical Society from10 a.m. to 4 p.m.
CAPTION: A model of the John H. Murray & Son Coal Trestle has been added to the annual Model Train Day at the Sayre Historical Society. The HO-scale model of the structure was constructed over hours of work, according to Thorne, a longtime local modeler. The actual building is located in South Waverly and was originally built in 1900. The model train event will feature two operating model train layouts, special displays, memorabilia vendors and more. One of the special displays at the museum is the scale model steam locomotive “Donald” built over 100 years ago by the late Michael Gorman of Sayre and loaned to the Sayre museum by his great-grandson, Mick Koons. On the second floor of the museum, railroad memorabilia vendors will offer for sale a large variety of vintage railroad items. Bob Gongleski of Vestal, NY specializes in LVRR ephemera including postcards, slides, photographs and books. Bob Pastorkey of Trackside Photo will have a large selection of 8 x 10 black and white photographs for sale. The photographs cover the Lehigh Valley, D.L. & W. and Erie-Lackawanna railroads. Richard Palmer, railroad author, is also scheduled to be present to sign copies of his books including The Coming of the Railroad to Sayre, and others. Local modeler Aaron Dickson will be demonstrating modeling techniques during the show. A special display will recognize the contributions to preserving local history by Jim Spears and Gary Severn, both of Sayre. Permanent exhibits at the museum focus on Sayre history including the Robert Packer Hospital, Dr. Donald Guthrie, downtown Sayre businesses, Belle Knitting, Sayre churches, and an entire room devoted to the Lehigh Valley Railroad. A special exhibit in the Rotating Exhibit Room features “The Art of M. Louis Gore,” a former Sayre resident who was a well-known local artist. The display includes numerous paintings, sketches and photographs from the Don Broughton Collection donated by Frank Evans of Sayre. The museum is open Wednesdays from 5 to 7 p.m. and Saturday’s from 10 to 4 p.m. For additional information, visit the museum website at www.sayrehistoricalsociety.org or go to Facebook. The all-volunteer museum is member-supported and a recipient of funds from the Bradford County United Way and the Bradford County Tourism Promotion Agency. SAYRE - A ten-panel mural that once decorated the lobby of the Wilbur Hotel in Sayre created by local artist M.L. Gore is the subject of a story in the Sayre Historical Society Quarterly magazine. CAPTION: Valley artist M. Louis Gore is the subject of a feature story in the Sayre Historical Society's latest Quarterly history magazine. The story focuses on Gore's "lost mural" at the Wilbur Hotel in Sayre. The "lost mural" featured local scenes such as the Robert Packer Hospital, the Lehigh Valley Railroad Shops, Belle Knitting and Ingersoll-Rand, as well as the Ulster totem pole, Turn-of-the-Rocks and "the crest looking toward Towanda." Numerous photographs and sketches created by Gore were donated recently to the Sayre Historical Society by Frank Evans of Sayre. The Sayre High School Class of 1967 is the featured photograph in the center section of the booklet which also includes the 1907 obituary of Sayre's namesake, Robert H. Sayre, and a story on the scale model steam locomotive named "Donald" built in the early 1900's by railroad engineer Michael Gorman. The Quarterly, published four times a year, is mailed to historical society members as part of their membership benefits. Individual copies are available at Carl's News Stand in Sayre and the historical society museum located in the former Lehigh Valley Railroad Passenger Station in downtown Sayre. Hours are Saturdays from 10 to 4 and Wednesdays from 5 to 7 p.m. The story on Gore outlines the life of the well-known artist whose work is preserved in numerous paintings in private collections as well as the mural in Sayre High School depicting Shepard's mill in Sayre. Gore was born on February 4, 1877 in Sheshequin and was a descendent of Judge Obadiah Gore who served under General John Sullivan during the Revolutionary War. "While a young man, Gore spent time abroad studying and returned to the U.S. where he became employed by J.R. Myers in Steubenville, Ohio," according to the Quarterly article. "In that capacity, Gore did mural and decorating work in churches, theaters and libraries from the midwest to the eastern seaboard," according to his December 30, 1967 obituary. An undated newspaper clipping included in the sketches and photographs donated by Evans documents the Wilbur Hotel mural which was completed in the late 1940s and early 1950s. The clipping states that the work took about six months to complete and that pictures of the mural sections "would easily pass for pictures of the actual scenes." It was stated that Robert Adams, proprietor of the landmark Sayre hotel, was planning "extensive improvements in the lobby to have it in keeping with the beauty of the murals," according to the undated newspaper article. In his full life, Gore participated in excavations at local prehistoric Indian sites including Spanish Hill. In 1951, Gore was the official advisor to the National Geographic Society during its expedition down the Susquehanna River commemorating General Sullivan's military campaign. "Mr. Gore was soundly grounded in local history and was contacted by many persons interested in the historical background of this community," stated the obituary. "Until his last illness, he was adding to his collection of over 2,000 rare books among which are a predominant number covering the early history of Pennsylvania and Bradford County." The Class of 1967 photograph was made available by the Sayre Area School District Archives and includes the names of each of the graduates. This year marks the 50th anniversary of the Class of 1967. The model of Lehigh Valley Railroad steam locomotive No. 218 has an interesting history which is recounted in the Quarterly. It was recently loaned to the Sayre Historical Society by Mick Koons of Pasadena, California, the great-grandson of Michael Gorman, the model builder who was also an engineer on the railroad. The name of the model memorializes Mr. Gorman's young son, who died in 1909 at the tender age of five due to complications from Scarlet Fever. The model has been displayed in a number of places along the route of the railroad. According to the Nov. 27, 1975 Star-Gazette, "It’s been a feature at a model railroaders convention in Niagara Falls, at the former Interstate Fair in Athens, in Cortland, at the Wagner Hotel in Waverly, in New York City several times, and in Ithaca, Buffalo, Lehigh headquarters at Bethlehem, Allentown and in Milwaukee, Wis., among other places." It 1991, it was displayed at the first Sayre History Fair at Sayre High School. A final feature of the Summer Quarterly are two scrapbooks items from the Robert Felt Collection. Seaman Second Class John Cannavino was one of five sons of Mr. and Mrs. John Cannavino of Sayre in the service. He participated in the Allied invasion of Normandy. Naval Aviation Cadet John Luczejko, son of Mr. and Mrs. A. Luczejko of Riverside Drive, Sayre was taking primary flight instruction in the Glenview, Ill. Naval Air Station. A World War II-era poster for a block dance to benefit the Sayre Canteen and a 1953 local advertisement complete the issue. A Genealogy Workshop is scheduled for Saturday, July 29 at the Sayre museum featuring local historian Henry Farley, president of the Bradford County Historical Society. A variety of resources including local directories, yearbooks, scrapbooks and railroad rosters will be available for research. Admission is free. SAYRE - Model Train Day will be held Saturday, November 24 at the Sayre Historical Society featuring two operating model train layouts, special displays, memorabilia vendors and more. 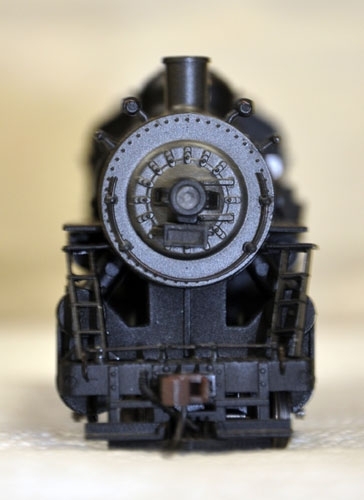 CAPTION: Model steam locomotives, like the one shown above, will be among the features at the Sayre Historical Society's Annual Model Train Day on Saturday, November 24, from 10 a.m. to 4 p.m. Admission is free. The hours are 10 a.m. to 4 p.m.
Two HO-scale model train layouts are permanent displays of the museum located in the historic Lehigh Valley Railroad Passenger Station. The first includes a detailed replica of the Sayre station, the Desmond Street Park, and buildings on Desmond Street from the 1940's and 50's. It was built by Don "Buckshot" Murray, a Navy veteran who worked for General Electric and passed away in 2008. His wife was the former Nancy Springer of Sayre. The second layout depicts a rugged coal mining operation and a small town typical of many communities along the route of the Lehigh Valley Railroad. Located in the building's old baggage room, the layout was built by Charles Dixon and moved in two sections to the museum building and reassembled. Another special display at the museum is the scale model steam locomotive "Donald" built over 100 years ago by the late Michael Gorman of Sayre and loaned to the Sayre museum by his great-grandson, Mick Koons. Built in memory of Mr. Gorman's five-year-old son, "Donald" is an operating model with moving driving rods, wheels and an accompanying music cylinder playing the song "Mr. Dooley." The century-old model has been on display in many places including the Wilkes-Barre LVRR station, movie houses and department stores in New York City, a model train convention in Niagara Falls, the former Interstate Fair in Athens, Bethlehem, Ithaca, Cortland, Buffalo and Milwaukee, Wisconsin. In 1991, it was displayed at the first Sayre History Fair. Bob Gongleski of Vestal, NY specializes in LVRR ephemera including postcards, slides, photographs and books. Bob Pastorkey of Trackside Photo will have a large selection of 8 x 10 black and white photographs for sale. The photographs cover the Lehigh Valley, D.L. & W. and Erie-Lackawanna railroads. A special exhibit in the Rotating Exhibit Room focuses on "The Art of M. Louis Gore," a former Sayre resident who was a well-known local artist. The display includes numerous paintings, sketches and photographs from the Don Broughton Collection donated by Frank Evans of Sayre. The museum is open Wednesdays from 5 to 7 p.m. and Saturday's from 10 to 4 p.m. For additional information, visit the museum website at www.sayrehistoricalsociety.org or go to Facebook.